By Brian Voo in Internet. Updated on November 19, 2017 . One of Chrome’s many strengths include syncing of all your bookmarks and Chrome extensions with a Google account, it also opens tabs in separate memory process so that you won’t have to shut it down entirely if one tab crashes. However, the implementation of separate memory processes means it uses lots of memory when you open many tabs. This can cause performance hiccups for users who don’t have enough RAM on their computers. 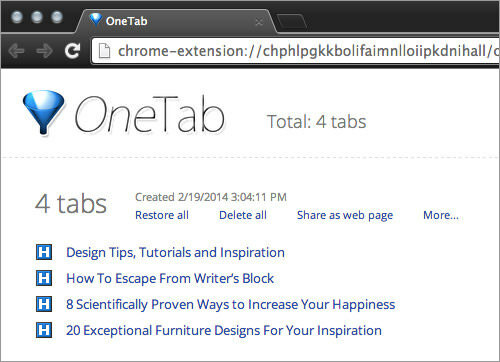 Here are 5 tools to help you manage tabs and release memory for use on Chrome. If you surf the web a lot and open a lot of content in multiple tabs, these Chome extensions will be great in giving you a smoother web surfing experience without slowing down your computer too much, ultimately allowing you to multitask with other programs. 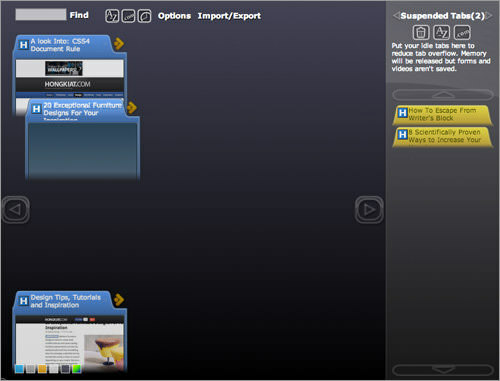 TooManyTabs is a great tab and memory manager with an easy to use and understand interface. Once installed, you will see this popup window where you can get a glance of all the opened tabs in that particular Chrome window. You can then choose to suspend tabs that you want to keep for later reading, freeing up some memory from Chrome so it runs faster and smoother. Tab Hibernation is a one-button tool that instantly puts all other tabs except the one you are currently vieweing into hibernation. Once installed, a button in the shape of a crescent moon will appear at the end of your address bar. Clicking on it will hibernate all your other tabs, freeing up Chrome’s memory for a smoother web surfing experience. 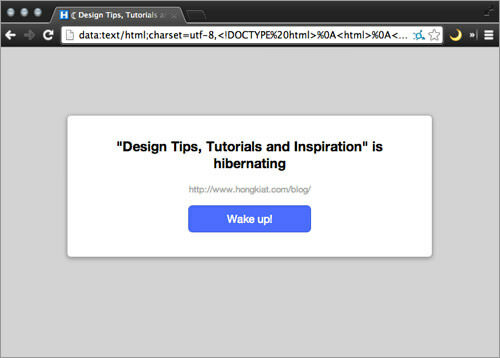 To wake up a hibernated tab, just click anywhere. If you’re someone who surfs the web using lots of tabs and browser windows, OneTab compresses all the opened tabs in that particular window into one tab, so you can see the content of all opened tabs. Doing this also frees memory from Chrome. You can then choose to close tabs, open them one at a time or restore them all. You can also group these tabs into a special category, enabling you to open it at a later time. Don’t have time to manually manage the tons of tabs opened on your Chrome browser? 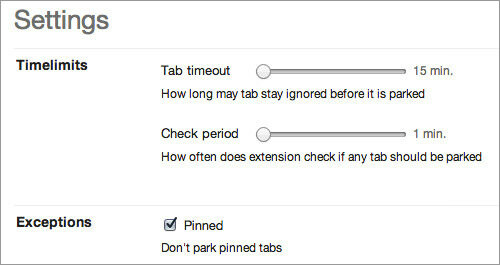 You can try TabMemFree that automatically helps you "park" inactive tabs. Parking a tab frees up the memory of that particular tab. It does this automatically if you have not accessed that particular tab for more than 15 minutes; you can set a longer tab timeout period too. When you go back to that particular tab, it’ll automatically reload letting you return to where you left off. 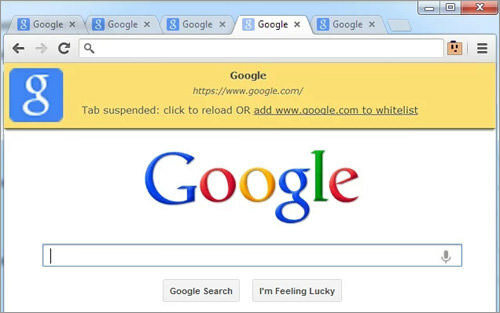 The Great Suspender helps you suspend tabs to free up some of Chrome’s memory. Clicking on the Great Suspender button lets you choose from suspending the current tab, suspending all other tabs or restoring all your tabs. The tool allows for automatic and manual suspending, configurable in the settings. The settings also allow you to set a whitelist of sites that won’t get suspended.